Although the newspaper reports on the errand as the culmination of Mr. Kirkness’s efforts, this trip to Curran Park marked only a small step forward in his prolonged campaign to commemorate the students who died at Brandon Residential School, an institution he had himself attended as a child and to which he worked in close proximity for much of his adult life. 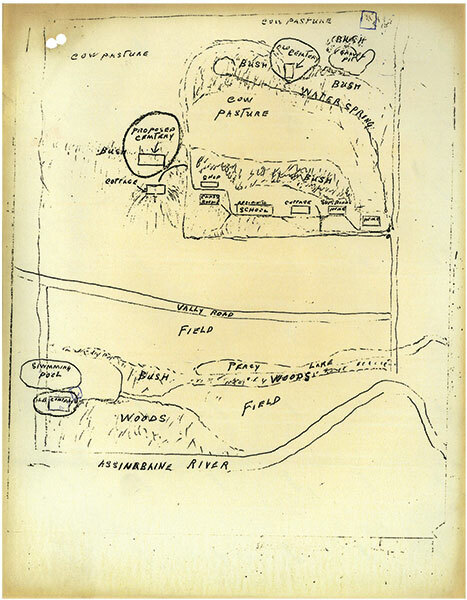 The following account was inspired by a remarkable series of letters sent by Kirkness to the Department of Indian Affairs in the years immediately following this initial identification of the Curran Park graveyard’s location. While the United Church of Canada currently has a project underway to memorialize the students buried in each of the two cemeteries associated with Brandon Residential School, Kirkness’s earlier struggle to win respect for the deceased students is itself worthy of remembrance. 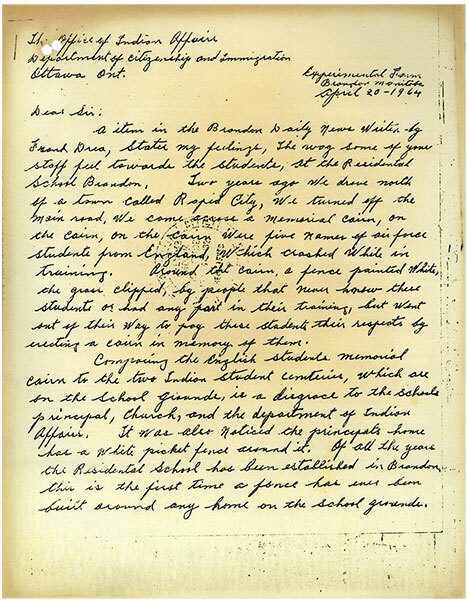 A 1964 letter written by Alfred Kirkness to the Office of Indian Affairs at Ottawa sought action for the residential school cemeteries at Brandon. A item in the Brandon Daily News written by Frank Drea, states my feelings. The way some of your staff feel towards the students, at the Residential School Brandon. Two years ago we drove north of a town called Rapid City, we turned off the main road, we came across a memorial cairn, on the cairn were five names of air force students from England, which crashed while in training. Around that cairn, a fence painted white, the grass clipped, by people that never knew these students or had any part in their training, but went out of their way to pay these students their respects by erecting a cairn in memory of them. Comparing the English students memorial cairn to the two Indian student cemeteries, which are on the school grounds, is a disgrace to the schools principal, Church, and the department of Indian Affairs. It was also noticed the principal’s home has a white picket fence around it. Of all the years the Residential School has been established in Brandon, this is the first time a fence has ever been built around any home on the school grounds. Mr. F. Bond, was approached by the Friendship council, on the condition of two cemeteries in his jurisdiction. So far he has not lifted a finger to improve these conditions. One of the cemeteries is located a half mile north of the school, in a cow pasture, the other is south a half mile, by the Assiniboine river, which over flows its banks at spring. The city of Brandon leased a parcel of land, from the department of Indian affairs some years ago for a park, three years ago the city of Brandon built a large swimming pool close by the cemetery. The fence is gone, and grave markers, no doubt by flows over these many years, the people stampeded over the graves. It saddened my heart to think the White Society would keep right on tramping over these graves, when they were told of the cemetery, and its location. If this is the culture of some of the White Society in discrimination they have succeeded very well. When the Experimental Farm at Brandon Man. took over the Schools land for research work, Mr. Waldon, the farms foreman got permission from Dr. E. J. Andrews Superintendent, to erect a temporary fence around the student graves which is located in a cow pasture. Mr. Waldron seen fit to protect these graves, if Dr. E. J. Andrews and Mr. Waldon, can show respect for these student surely, men holding positions in the Indian Affairs, can do more towards improving these cemeteries. I have a suggestion, I would like to put before you the Indian Affairs. Could the remains of these students be removed to a more suitable location? 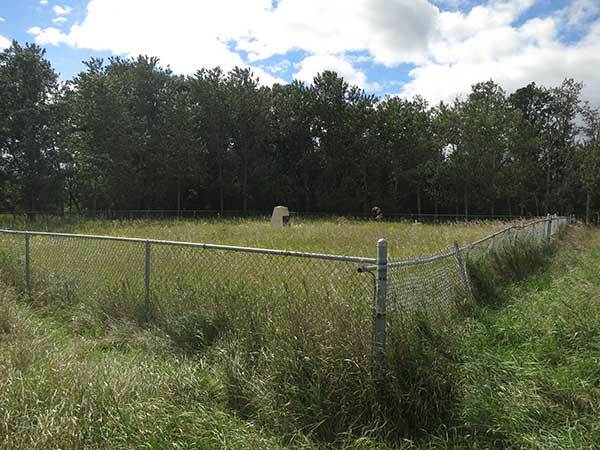 There is a parcel of land north of the cottage, that is west of the Residential School, that would made a ideal spot for a Memorial Cemetery. Mr. Bond’s home is very nice to look at with its White picket fence, and all, but what about his back yard? I can picture the women from the church, and the Officials of Indian Affairs inspecting the children, and buildings, and smiling with approval. But do they pay homage to the students, who are laying at rest, in a disgraceful conditioned cemetery? [Andrews] refers to a discussion of the southern cemetery with the City manager, since the City of Brandon leases the surrounding area. Mr. Andrews thought the area was too large to be fenced, but in a letter dated October 21 (photocopy enclosed) the Agency Superintendent suggests a fence. I feel moving the cemetery from the City Park area would be rather difficult, as no one is sure where the graves are, as no one has been buried there since 1912. May I suggest that the City of Brandon, the department of Agriculture and Indian Affairs Branch erect a small cairn on the location where Mr. Kirkness feels the cemetery was. When we visited the site yesterday, the area was all grassed with a picnic table sitting to one side. But they did mention adding two more wings to the Building you already have. We build empires of great buildings of stone, steel and brick, we add wings to buildings we already have. Thousands is spent for people to see, what great things the department can boast about. The glory of these things will pass away, but the one thing that men will remember is a cup of cold water given in love. The little things we do for others, are the big things, we do for ourselfs. I’m sure a cup of cold water, will be a small price to pay to have these students remains moved, compared to the price the department is willing to spend on building two new wings. I’m sending in a picture report on the conditions of the cemetery north of the school, you will see what I mean when I say, is your school going to be large enough to hide the condition of this cemetery? A photo from May 1964 provided by Alfred Kirkness to the Office of Indian Affairs showed fallen wooden crosses that presumably marked individual graves. The cemetery Mr. V. [sic] J. Kirkness is referring to has been the subject of considerable correspondence, and is located at the Brandon Residential School. I personally examined the cemetery at the Brandon Indian Residential School and agree with Mr. Kirkness that same is an unsightly mess and if you will refer to correspondence on file, Mr. Bond has agreed to tidy the cemetery, providing funds be made available in the amount of $250. In the Spring of 1964, I wrote Mr. Davey, of the Indian Affairs, Stating in my letter The condition of two cemeteries, which the Residential School Brandon Man. buried its deceased. The first cemetery is a half mile south of the School by the Assiniboine River, in the year 1915, Rev. T Ferrier leased a portion of land to the City of Brandon for a park when he know he had buried a number of his School Students there, We will never know. There should have been a clause in the lease, before this land was transferred over to the city, wereby the city of Brandon would keep this cemetery in repair as long as the city of Brandon held the lease, but this was not the case. Therefor this cemetery was destroyed little by little each year, until one day, I saw picnic tables, benches and barbecue stands, placed over these students graves. Would you agree, with my thinking, that the city of Brandon should replace the fence they tore down? I wrote the Mayor of Brandon, S. A. Magnacca, stating what I had seen, this is part of his letter. Quote I wish to advise that it is the first intimation that there is a cemetery there, and I shall have it looked into, and see what can be done. Unquote. The tables, benches and barbecue stands are off, as yet no fence. The second cemetery is a half mile north of the school, which was shamefully disregarded, this cemetery is placed in a cow pasture surround by cow dung. When I wrote Mr. Davey, I suggested this cemetery be moved to a new location nearer to the school and a cairn be placed in the cemetery, for the students that left this school to fight in the first and second world wars. The student lives that was sacrificed in these wars, should have some claim on the rights and respect to be shown on their fellow students that are deceased and buried in this cemetery. Mr. Davey, sent a representative in the summer of 1964 to see for himself the condition of these cemeteries, what he saw shocked him, For Mr Bond the principal had cleaned up this cemetery, over each grave he placed a mound of gravel. In the fall of 1966 I went to see what progress had being made the grass was knee high. I was up to see the cemetery again today the grass and bushs are so high I can not see the gravel mounds on the graves. Dont you think its about time the Dept did some thing to stop this sort of discrimination? Dont you think it would be honourable to move the remains of these students away from this dung hill? When speaking to Mr. Davey’s representative about moving the students remains he told me that these students remains would be decomposed years ago, and can not be moved. Enclosed is a clipping from the Brandon Sun news paper showing that Mr. Davey’s representative is far from the truth. [The letter includes a newspaper clipping about workers uncovering bones estimated to be between 500 to 1,500 years old at the site of the Simplot chemical plant.] Another evidence, is in the case of Rev. James Evans, Died in England at the age of 45 in 1846 and was buried in his home town, but more than a century later his remains were removed and cremated, his ashes being shipped to Norway House Manitoba, there in 1955 they were interred under a simple cairn bearing the words James Evans 1801-1846, if they can do this for a missionary, surely these students remains can be moved a half mile. Enclosed are pictures of the north cemetery and one of the cemetery by the river, from 1963-1966. The letter also included a clipping showing a sketch of a Centennial year cemetery and a memorial cairn for the students who fought in the first and second World Wars. I am enclosing a copy of a letter addressed to the Minister by a Mr. A. J. Kirkness of the Experiment Far[m] at Brandon regarding the condition of two cemeteries in the vicinity of the residential School at Brandon and in which apparently are buried residential school students. Mr. Kirkness complained about the condition of these two cemeteries in 1964 and I am also enclosing copies of correspondence with him at that time. Mr. Clark had suggested in 1964 that the two cemeteries be moved but no action was ever taken. I feel this problem must be settled once and for all by relocating the cemeteries. This would appear to be a project for which development funds could be used but if you are unable to meet the cost, please let me know and we will discuss with the Branch Financial Adviser the source from which funds should be obtained. It would be impossible to move the cemeteries at this date due to the ground being frozen and I am not convinced that the cemeteries should be moved as the site suggested by Mr. Kirkness is still in the pasture field on land turned over to the Department of Agriculture Experimental Farm, Brandon. I personally visited both areas in 1964 with Mr. Kirkness, and we were unable to locate any of the graves adjacent to the Assiniboine River on property presently owned by the City of Brandon and used as a park. At this time, Mr. Kirkness felt he could show someone where the graves were and possibly the remains could be lifted and moved to a new location, if permission were obtained from the City of Brandon and the Attorney General of the Province of Manitoba. The present cemetery to my way of thinking, is located in a nice area but requires a care-taker to make sure the fences are looked after and grass and trees are kept trimmed. The cemetery on land now owned by the City of Brandon has been bulldozed over and the surface of the ground so level that it would be impossible to determine where the individual graves are situated. It would therefore require a major operation to dig the area up to discover the graves, and this may be construed by some people as sacrilege. There is some feeling by the Indian people that the dead should rest in peace, and whatever mistakes have occurred in the past in violating the sanctity of the ground should not be compounded by further disturbing the area. We would recommend that a cairn be erected over the area and the known area fenced with a chainlink fence. It is believed that the City of Brandon would maintain the ground once it was fenced. It is also possible that something could be added later to turn it into a site of interest at some future date without disturbing further the resting place of the deceased. The second cemetery is on Crown Canada land which was previously under the administrative control of Indian Affairs. When Indian Affairs had no further use for this land, the administrative control was turned over to the Dominion Government Department of Agriculture. We believe that this area should also be fenced with a chain-link fence, as the pasture is presently used for the grazing of cattle and there is some concern as to whether or not cattle should be permitted to graze over known burial ground. Mr. Nield informs us that he believes the cairn and the fence around the City of Brandon Park where the first cemetery is located would cost approximately $2,000.00 and the fencing of the larger area of the burial ground on the Department of Agriculture ground would also cost $2,000.00. It is recommended that Mr. Nield place a sum of $200.00 on his Estimates every year for the maintenance of the cemetery on the Department of Agriculture land. The pupils for the Brandon Residential School were drawn from many areas and could therefore come from many different Bands….No Band, therefore, has assumed responsibility. It would appear that having directed the children to the school, the matter of dealing with the cemeteries is an Indian Affairs responsibility and should be dealt with. Mr. Nield informs me that no money has been placed on his Estimates for the development of neglected Indian cemeteries, nor has there been any money budgeted or set aside in Regional Office funds. There is no provision made in the 1967-68 Estimates. However, Mr. Nield would be pleased to carry out the work if funds can be found to undertake the plans suggested above. Significantly, given the matter’s later resolution, Knapp’s report addresses both cemetery locations, rather than just the graves found on the Curran Park land currently owned by the City of Brandon. I was visited by Mr Ford Bond of the Indian Residential School who informed me that there is a grave yard in close proximity to the School where a cairn could be erected and maintained. He told me that the Indian Affairs Branch at Ottawa was agreeable that a small cairn should be erected at this area rather than in the picnic area at Curran Park as, no doubt, a cairn in the latter area would be defaced before too long. Mr. Bond said that Mr. Kirkness had been contacted with respect to the suggestion and that it has been acceptable to him. In consequence whereof the City Council has received and filed your letter, in view of the representations that I made to City Council on behalf of Mr. Bond. On 19 August 1968, Nield replied that the plaque should be installed within the week. Less than two years later, in the summer of 1970, the general condition of the cemetery on the grounds of the experimental farm had once more deteriorated to the point where Kirkness was inspired to intervene. Although a fence had been built and a cairn erected, for Kirkness these acts remained token gestures as long as the department failed to properly maintain the graveyard out of respect for the memory of the students. Hidden in an overgrown cow pasture, the cemetery and the students were too conveniently forgotten. In the year of 1965 a Cairn was erected in memory of a dead settlement, bands playing, a speech from the Mayor of Brandon. Also from M.P.s from every constituency. Dignitaries from every walk of life were there to pay tribute to a dead settlement. Not many miles west in a cow pasture another Cairn was erected in a cemetery in memory of students that attended the Residential School Brandon Manitoba. It was a quiet Service, a number of cows, one-two field gophers, where presented, some crows flew over head, in the distance a meadow lark sang its evening Song. It was suggested five years ago, the remains of these Students be moved away from this cow pasture, nearer to the Residential School. It was also pointed out to the Indian Dept. that over five hundred head of cattle shared this pasture at the time, today a thousand Head of cattle are pastured. The Indian Dept. promised to build a road through this pasture to maintained the Students cemetery through the summer months, also two hundred dollars would be provided each Season for its Maintenance. A picture of the Mental Hospital’s cemetery is inclosed on its cairn, these words are written. The care of the cemetery proves the fact. These cemeteries are not in use any more but the Mental Hospital is beautifully kept. Where as vandalism through discrimination is quite evident on the part of the previous Supervision of the School. Grass in this cemetery is three feet high which you can see in the picture, for the cairn is five feet in height. Personnel attaining three thousand head of cattle think it’s a disgrace in the manner this cemetery is kept. November 4th, of 1970, I received a letter from Mr. W. A. Gryba,  Chief of the bureau of Indian & Eskimo Administration. In part, I quote, you will be interested to learn that as a result of your concern for the care of the cemetery, this Dept. is now undertaking an investigation into the feasibility of moving the graves to a more appropriate site. In the meantime the Residence Administrator has taken steps to improve the appearance of the present site by cutting the grass; repairing the fence, and assuring continued maintenance. Unquote. Yesterday, I went to see if this landscaping had been done, by the architect, Mr. K. Cavangh. You can’t imagine the shock I received when I saw the hideous condition they left the cemetery. Common gravel was hauled straight from the pit which is close by and dumped over the graves, to smother the grass from growing in this way the problem of mowing grass and continued maintenance would be eliminated. Sir, it looks like a barn yard, no doubt the architect had this in mind, seeing the cattle share the same pasture. I have read and seen pictures of cemeteries for dogs, & cats, where the rich bury their pets, which is second to none. This is the first I have seen where gravel is dumped over graves deliberately. Speaking with your field supervisor last fall he suggest a plan, which is inclosed, if the department decide not to move the students graves to a more appropriate Site. 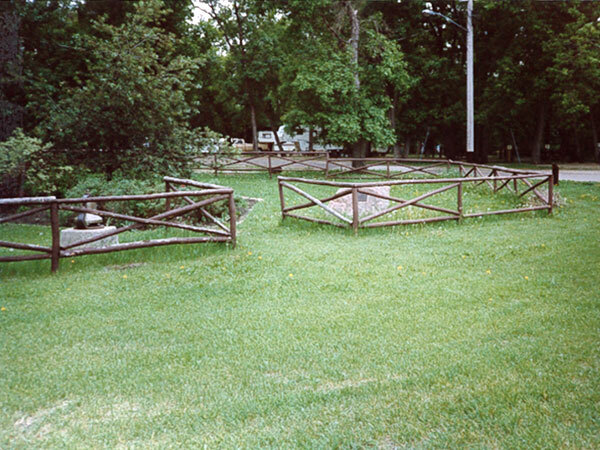 “Indian Children Burial Ground.” In 1972, the Brandon Girl Guides placed a commemorative monument at the site of the former residential school cemetery in Curran Park. It was still there at the time of this photo taken around 2000. Although Kirkness did not manage to have both cemeteries transferred to a single location where the graves would be more consistently cared for, he did succeed in drawing public and government attention to their condition. His efforts resulted in a permanent record of where both cemeteries were located, and a list of at least some of the children who had died at the school. His carefully constructed arguments, thoughtful writing, and concern for the memory of the children who died at the school caught not only the attention of Indian Affairs and the City of Brandon, but engaged the interest of community groups, including the local Friendship Centre and the Girl Guides. The Department of Indian Affairs never failed to acknowledge the legitimacy of Kirkness’s indignation at the cemeteries’ neglect, but the department’s commitment to maintain the grounds of the cemeteries became repeatedly entangled in thickets of bureaucratic delegation and budgetary constraints. Kirkness’s efforts are exemplary in his refusal to let the department feel that they had put the matter to rest. Because of the perseverance of Alfred Kirkness, the two cemeteries associated with the Brandon Residential School were not forgotten. His campaign stands as an example of the powers of persistence in the service of a cause, and of how the efforts of one person can indeed make a difference. The Brandon Residential School Cemetery near the former school building site, September 2014. A commemorative monument in the cemetery lists the names of eleven people known to be buried here but it is believed there are other unmarked graves inside and outside a chain link fence at the site. 1. Melvin J. Shelley, PEng, City Manager, City of Brandon. Shelley was appointed City Manager in 1962. Brandon Sun, 4 July 2012. 2. Andrews began his research career in 1949 at the Department of Agriculture`s Winnipeg Research Station. In 1951 he transferred to the Lethbridge Experimental Farm, and was made Director of the Brandon Experimental Farm from 1960 to 1965. Returning to Lethbridge, Andrews directed the Research Station at Lethbridge, AB from 1969 to 1981. In 1981, he was named the Department of Agriculture’s senior administrator for Western Canada. Lethbridge Herald, 9 July 9 1982; Canada, Government of, Brandon Research Centre, 1886-2011, Celebrating 125 Years (2011), page 2; Sheila Torgunrud, The Lethbridge Research Centre: Journey to the Centennial and Beyond (2006), page 33. 3. “Mystery of Graves at Curran Park is Solved,” Brandon Sun, 5 June 1963, second section. 4. It is likely that his mother died when he was very young, which is probably why he was sent to the school at such an early age. Ellen Kirkness is noted as deceased in Alfred Kirkness’ 1908 application to the school. Library and Archives Canada, RG10, 1984-85/402, Volume 13761, “Admission of Pupils–Brandon Industrial–Residential School, Part 01, 1895/01/01 to 1933/12/31; Metis National Council (MNC) database, scrip entry for Kirkness, Alfred. Available at: http://metisnationdatabase.ualberta.ca/MNC/NWScrip.jsp?recordId=126&recordTypeRaw=0378NW, accessed 28 June 2013. 5. Variously known as the Brandon Industrial School, Brandon [Indian] Institute, Brandon Indian School, Brandon Residential School, and Brandon Indian Residence at different times, the school opened in 1895 under the auspices of the Methodist, and later, the United Church of Canada. From its creation, the school included a substantial farm. Farming operations at the school ended in 1957, at which time much of the farm land, including the land where one of the two cemeteries associated with the school was located (the newer cemetery on the hill above the school) was transferred to the Brandon Experimental Farm (or Research Station, as it is now known). The school was transferred from the United Church to the Roman Catholic Oblates, who began the process of closing the school in 1970. The school closed permanently in 1972. For more on the history of the school, see: http://thechildrenremembered.ca/schools-history/brandon/. 6. It is likely that there were other Kirkness children at the school, including a brother, John James (known in the school’s records as “John, Sr.”, a brother named George, and sisters Amelia, Annie, and Mary. John and George, Amelia, and Annie all began as students at Brandon in 1906. John and George left in 1911. Library and Archives Canada, RG10, 1984-85/402, Volume 13761, Admission of Pupils–Brandon Industrial–Residential School, Part 01, 1895-01-01 to 1933-12-31, Admissions and discharges, Brandon School, September quarter, 1905, and Report of the Industrial School at Brandon, September, 1907, Admissions and Discharges, Brandon School, First Quarter, 1911; Brandon Sun, 13 July 1967, 11; Annual Report of the Department of Indian Affairs for the Year Ended March 31, 1928; Dominion of Canada Annual Report of the Department of Indian Affairs for the Year Ended March 31, 1929. http://www.collectionscanada.gc.ca/databases/indianaffairs/001074-110.01-e.php?PHPSESSID=3mhfj9lfvhcb0tf5a3qfsusgb1&interval=169&q1=Kirkness&c1=&b2=AND&q2=%22File+Hills%22&c2, accessed 28 June 2013. 7. Manitoba Vital Statistics database, marriages: Marriage 2 June 1932, registration number 1932,027344. http://vitalstats.gov.mb.ca/ListView.php, accessed 28 June 2013. 8. It is possible that the couple may have also had a son, Montague, who drowned in Lake Percy in 1943, at the age of ten. Brandon Sun, Obituary: “James Kirkness,” 2 February 1980, 18. Winnipeg Free Press, 15 November 1943, page 20; Kitsap Sun, Obituary, 9 March 1993, http://www.kitsapsun.com/news/1993/mar/09/obituaries/#axzz2XW2BFPAY, accessed 28 June 2013. 10. This park was initially was called Suburban Park, a name used until a formal name change in 1934 in honour of J. P. Curran. Winnipeg Free Press, “Western News in Brief: Brandon Man Honored,” 3 May 1934, page 4; Brandon Sun, 14 February 1995. The city first set aside $6000 for the acquisition of a new city park in 1911. The Parks Board and City Council passed a resolution to ask the government to donate land for the park; by the summer of 1912, negotiations to acquire land from the parcel of Crown land the Brandon Industrial School was located on were underway with the superintendent of the school, the Rev. Thomas Ferrier. However, talks soon stalled, the survey of the lands dragged on, and by 1915, with the First World War underway, talks had completely stopped, not resuming until the autumn of 1919. Finally, negotiations with Ferrier for a 99-year lease on part of the Industrial School’s lands, for the sum of $6000, were completed in December of that year, although the lease was not finalized, and the Park officially brought into existence, until early 1921. Brandon Public Parks Board Minute Book, Volume 1, 31 July 1911; 28 August 1911; 24 June 1912; Brandon Public Parks Board Minute Book, Volume 2, 30 September 1919; 22 December 1919; 31 January 1921; School File Series - 1879-1953, available at: http://www.collectionscanada.gc.ca/microform-digitization/006003-119.02-e.php?q2=2&q3=237&sqn=1942&tt=2186&PHPSESSID=gljoevl5qu53jnc8vlmhnemae1, accessed 13 September 2013. In March 1965, the City and Department of Agriculture (in right of the Crown) agreed to terminate the lease, presumably allowing the City to acquire the land outright. City of Brandon Records Centre, File HMK-CAIA-LE-1 “HMK In Right of Canada; Department of Indian Affairs; Lease; Curran Park.” As a postscript, when Curran Park was sold to Gretna businessman Gerald Voth in 2001, one of the stipulations of the sale was that Voth maintain the cemetery in the park. Brandon Sun, 20 February 2001. 11. Starting as early as 1931, the city of Brandon asked the Brandon Parks Board to undertake development of Suburban Park as a part of their unemployment relief planning. Work by relief workers continued at least until 1936, and included clearing the land of underbrush, thinning the trees, putting in and grading a road, and building latrines; it is likely that much of the work hay-cutting and reseeding the land during this time was also done as relief work. City of Brandon Records Centre, Brandon Park Boards, Minute Book, Volume 2, 28 December 1931, 30 May 1932, 391; City of Brandon Archives Records Centre, Brandon Park Boards, Minute Book, Volume 2, 30 January 1933, 402; City of Brandon Records Centre, Brandon Park Boards, Minute Book, Volume 2, 30 December 1933, 419; City of Brandon Records Centre, Brandon Park Boards, Minute Book, Volume 2, 25 June 1934, 436; City of Brandon Records Centre, Brandon Park Boards, Minute Book, Volume 2, 24 September 1934, 441; City of Brandon Record Centre, Brandon Park Boards, Minute Book, Volume 2, 25 March 1935, 450. Brandon Sun, front page, 5 June 1963. 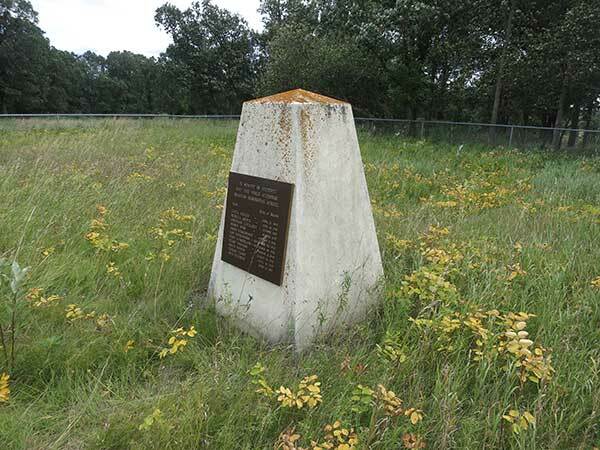 It was Dr. Andrews of the Experimental Farm who indicated that some of the markers had been removed by work crews clearing the area in the 1930s. 12. See, for example, Brandon Sun, 17 August 1959; Brandon Sun, 16 September 1959; Brandon Sun, 4 October 1960; Brandon Sun, 19 April 1961. Developments to the park appear to have been gradual. A refreshment stand was approved in the spring of 1933, and a “large cook stove” was donated to the Parks Board with the express intent of having it installed at Curran Park. It appears that the cookstove was eventually installed, as the city had several problems with missing keys and break-ins to the cookhouse in 1935 and 1936. This cookhouse may be the same one that Kirkness thought was near or over some of the graves. Modern maps show a “cook shack” near the memorial cairn. City of Brandon Records Centre, Brandon Park Boards Minute Book, Volume 2, 24 April 1933, 410; City of Brandon Records Centre, Brandon Park Boards Minute Book, Volume 2, 25 June 1934, 436; City of Brandon Records Centre, Brandon Park Boards Minute Book, Volume 2, 24 June 1935, 457; City of Brandon Records Centre, Brandon Park Boards Minute Book, Volume 2, 28 October 1935, 462; City of Brandon Records Centre, Brandon Park Boards Minute Book, Volume 2, 30 December 1935, 464; City of Brandon Records Centre, File #6100-3 (1999-2001), Vol. 1 “Sale of Curran Park”; Brandon Sun, front page, 5 June 1963. 13. The older cemetery in then Curran Park was probably in use from about 1896 until somewhere between 1912 and 1923. Library and Archives Canada, RG10, 1984-85/402, Volume 13761, Admission of Pupils – Brandon Industrial – residential School, Part # 01, 1895-01-01- 1933 -12 -31, Admissions and Discharges Quarter July 1895; Library and Archives Canada, Online MIKAN no. 2058571, Correspondence Regarding the Education of Indian Children (Newspaper Clippings and Stats on Discharge and Deaths in Industrial Schools from 1883-1898 Included), “Statistics of Discharges and Deaths since the opening of Industrial Schools to the 31st December 1898”; City of Brandon Records Centre, 6100-0 (1996-1998) “Curran Park”, 01663, MGS 17; Library and Archives Canada, RG10, 2000-01600-6, Box 053, File 577/36-7-576, Leases & Individual Case Files – Cemetery – Brandon Residential School, Part 01, 1963-06-01 – 1970-03-31, 13 May 1964 reply from Nield. It is possible that both of these dates are estimated. Martin Kavanagh, The Assiniboine basin: A Social Study of the Discovery, Exploration and Settlement of Manitoba, Winnipeg: Public Press, 1946, pages 227-228; Library and Archives Canada, School Files Series (RG10), microfilm C-8649, Mikan 157505, letter J. D. Mclean, 14 February, 1921. 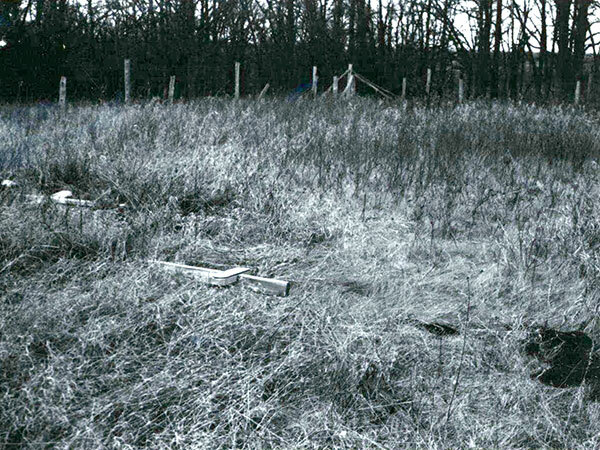 The newer cemetery on the hill was in use at least until 1956, and in 1963, the Department of Indian Affairs stated that burial on school grounds would no longer be considered, “but that arrangements should be made for burial in a cemetery of the appropriate faith.” United Church of Canada Manitoba and Northwestern Ontario Conference Archives, Brandon and Portage la Prairie Burial Registers. UCC Manitoba, St. Paul’s (Brandon Central): Bu 4, Burial Register Aug. 1952- July 1964, page 11. Location: Brandon, Central, Box J; Library and Archives Canada, RG10, 2000-01600-6, Box 053, File 577/36-7-576, Leases & Individual Case Files – Cemetery – Brandon Residential School, Part 01, 1963-06-01 – 1970-03-31, AG Leslie, Regional Supervisor, to DAH Nield, Superintendent, Portage la Prairie Agency, 18 October 1963. 14. Brandon Sun, “Mystery of Graves at Curran Park is Solved,” 5 June 1963, second section. Library and Archives Canada, RG10 – Indian and Inuit Affairs, 2000-01600-6, Box 053, File 577/36-7-576, Leases & Individual Case Files – Cemetery – Brandon Residential School, Part 01, 1963-06-01 – 1970-03-31, Memorandum from R. F. Davey, Director of Education Services to Regional Director, Manitoba, 1 December 1966. Library and Archives Canada, RG10, 1984-85/402, Volume 13548, File 577/3-8, Complaints and Petitions, Part 03, 1968-03-23 to 1972-07-10, letter from Alfred Kirkness to Hon. Jean Chréetien, Minister of Indian Affairs, Ottawa, 18 August 1971. 15. These letters and related correspondence can be found in the following files held at LAC’s Regional Archival Program – Winnipeg Office: Library and Archives Canada, RG10, 2000-01600-6, Box 053, File 577/36-7-576, Leases & Individual Case Files – Cemetery – Brandon Residential School, Part 01, 1963-06-01 – 1970-03-31; Library and Archives Canada, RG10, 1984-85/402, Volume 13548, File 577/3-8, Complaints and Petitions, Part 03, 1968-03-23 to 1972-07-10; and Library and Archives Canada, RG10, 2001-01060-5, Box 008, File 501/36-4, Miscellaneous Land Matters – School Land, Part 04, 1959-02-01 to 1968-11-30. All three files are open for consultation, with the exception of some pages from 1984-85/402, File 577/3-8, which have been removed due to restrictions under the Privacy Act. None of the restricted pages in file 577/3-8 concern Alfred Kirkness or the Brandon Residential School Cemeteries. 16. Library and Archives Canada, RG10, 2000-01600-6, Box 053, File 577/36-7-576, Leases & Individual Case Files – Cemetery – Brandon Residential School, Part 01, 1963-06-01 – 1970-03-31, 19 July 1963, June 5, 1963: J. E. Andrews, Research Director, Brandon Experimental Farm, Department of Agriculture to D. A. H. Nield, Superintendent Indian Agency. 17. Library and Archives Canada, RG10, 2000-01600-6, Box 053, File 577/36-7-576, Leases & Individual Case Files – Cemetery – Brandon Residential School, Part 01, 1963-06-01 – 1970-03-31, R. F. Davey, Education Director, to Ford Bond, Principal, 6 March, 1970. The principal of the school at the time replied to these enquiries that “Upon checking this we find only one grave with a marker and that is for Ewart Fiddler died 1955 the date is not clear. There are a few more graves up there, but none with readable markers, and can find no record of any in the files,” reply from Ford Bond 25 Sept 1963, Library and Archives Canada, RG10, 2000-01600-6, Box 053, File 577/36-7-576, Leases & Individual Case Files – Cemetery – Brandon Residential School, Part 01, 1963-06-01 – 1970-03-31. 18. Library and Archives Canada, RG10, 2000-01600-6, Box 053, File 577/36-7-576, Leases & Individual Case Files – Cemetery – Brandon Residential School, Part 01, 1963-06-01 – 1970-03-31, 19 July 1963: D. A. H. Nield, Superintendent Indian Agency to J. E. Andrews, Research Director, Brandon Experimental Farm, Department of Agriculture. 19. Kirkness is likely referring to the Cardale Air Crash Monument, located near the Rural Municipality of Saskatchewan, about 10 kilometres west of Highway 270 north of Rapid City. 20. Born in 1905 in Leeds, UK, Ford Bond had been working as the General Manager of the Brandon Branch of the Plains Western Natural Gas Company when he was hired as the administrative principal of the Brandon Residential School in 1959. In an article about his appointment in the Brandon Sun, Bond allowed that “He has never done welfare work among the Indians,” but stated that “he has always participated with keen interest in child welfare work. ‘After all when it comes to kids – all are alike’ he said.” (Brandon Sun, “Ford Bond is New Principal,” 8 August 1959). Bond continued as the school’s administrator until his retirement in June 1970. (Brandon Sun, “Around Town,” 28 May 1970). He died 26 October 1982 in Victoria, British Columbia. Although his obituary appeared in the Brandon Sun, it made no mention of his work at the school (Brandon Sun, “Obituaries,” 2 November 1982). 21. Library and Archives Canada, RG10, 2000-01600-6, Box 053, File 577/36-7-576, Leases & Individual Case Files – Cemetery – Brandon Residential School, Part 01, 1963-06-01 – 1970-03-31: Letter to The Office of Indian Affairs, Department of Citizenship and Immigration, Ottawa, ON, 20 April 1964. 22. R. F. Davey taught in an Indian day school in British Columbia during the 1930s, returning as a district school inspector in 1947. Dominion of Canada Annual Report of the Department of Indian Affairs for the Year Ended March 31 1934, Details of Expenditure, part 1 - 31, available at: http://www.collectionscanada.gc.ca/databases/indianaffairs/001074-119.01-e.php?page_id_nbr=32488&PHPSESSID=2a9ndus6aa27ekve5d0ib76250 accessed on 14 August 2013; Byron King Plant, “The Politics of Indian Administration: A Revisionist History of Intrastate Relations in Mid-Twentieth Century British Columbia, PhD dissertation, University of Saskatchewan, 2009, page 106. By 1954, Davey had become the [Department of Indian Affairs’] Superintendent of Education, a position he held until the late 1960s. Plant, “Politics of Indian Administration,” 106; Brian Titley, “Industrious, but Formal and Mechanical: The Sisters of Charity of Providence in Residential School Classrooms,” Historical Studies in Education 22.2 (Fall 2010), 58-74. Available at: http://historicalstudiesineducation.ca/index.php/edu_hse-rhe/article/view/2403/3180 accessed on 14 August 2013. 23. Library and Archives Canada, RG10, 2000-01600-6, Box 053, File 577/36-7-576, Leases & Individual Case Files – Cemetery – Brandon Residential School, Part 01, 1963-06-01 – 1970-03-31, 24 April 1964. 24. Library and Archives Canada, RG10, 2000-01600-6, Box 053, File 577/36-7-576, Leases & Individual Case Files – Cemetery – Brandon Residential School, Part 01, 1963-06-01 – 1970-03-31, Davey to the Regional Supervisor – Manitoba, 24 April 1964. 25. Born 9 June 1910 in the Rural Municipality of Silver Creek, the son of David George Nield, David Andrew Howard (D. A. H.) Nield appears to have begun his career with the Department of Indian Affairs during the 1930s. By the late 1950s, Nield was the Indian Agent at Portage la Prairie. He was Superintendent in charge of the Portage la Prairie Agency by 1963, continuing into 1967, but by 1968 was the superintendent in charge of the Brandon district, a position he continued to hold in 1969. About 1969 or 1970, he and his wife Dorothy moved to Victoria, BC, where he passed away on 12 July 1975. Manitoba, Manitoba, Department of Vital Statistics, registration of birth, registration number 1910,004681; Manitoba Historical Society, Memorable Manitobans, “David George Nield,” available at: http://www.mhs.mb.ca/docs/people/nield_dg.shtml accessed 15 August 2013; Dominion of Canada Annual Report of the Department of Indian Affairs for the Year Ended March 31 1936, part I, 11. Available at http://www.collectionscanada.gc.ca/databases/indianaffairs/001074-119.01-e.php?page_id_nbr=32688&PHPSESSID=bvr77uikjntkjqcdh2i8ooal73 accessed 15 August 2013; Dominion of Canada Annual Report of the Department of Indian Affairs for the Year Ended March 31 1938, Part L, 68, available at http://www.collectionscanada.gc.ca/databases/indianaffairs/001074-119.02-e.php?page_id_nbr=33146&PHPSESSID=bvr77uikjntkjqcdh2i8ooal73 accessed 15 August 2013; Peter Douglas Elias, The Dakota of the Canadian Northwest: Lessons for Survival, Winnipeg: The University of Manitoba Press, 1988, page 196; Roy W. Meyer “The Canadian Sioux: Refugees from Minnesota.” Minnesota History 41.1 (Spring 1968), page 27; “Unknown in life, Flora Elk is now important,” Brandon Sun, 18 December 1968, n.p. ; “Inquest jury didn’t fix responsibility,” Brandon Sun, 19 February 1969, n.p. ; British Columbia Vital Statistics death registrations, registration number 1975-09-010623; Obituary: Dorothy Elizabeth Nield, Winnipeg Free Press, 2 March 1976, page 30. 26. Library and Archives Canada, RG10, 2000-01600-6, Box 053, File 577/36-7-576, Leases & Individual Case Files – Cemetery – Brandon Residential School, Part 01, 1963-06-01 – 1970-03-31, Memorandum: from A. G. Leslie, Regional Supervisor, Manitoba to D. A. H. Nield, Supt. Portage la Prairie Indian Agencies, 5 May 1964. 27. Library and Archives Canada, RG10, 2000-01600-6, Box 053, File 577/36-7-576, Leases & Individual Case Files – Cemetery – Brandon Residential School, Part 01, 1963-06-01 – 1970-03-31, D. A. H. Nield to A. G. Leslie, Regional Supervisor of Indian Agencies, Manitoba, 13 May 1964. 29. Library and Archives Canada, RG10, 2000-01600-6, Box 053, File 577/36-7-576, Leases & Individual Case Files – Cemetery – Brandon Residential School, Part 01, 1963-06-01 – 1970-03-31, Officer in Charge [J. D. Minnis], Manitoba Regional Office to Assistant Director – Education, 25 May 1964. 30. Library and Archives Canada, RG10, 2000-01600-6, Box 053, File 577/36-7-576, Leases & Individual Case Files – Cemetery – Brandon Residential School, Part 01, 1963-06-01 – 1970-03-31, Officer in Charge [J. D .Minnis], Manitoba regional Office to Assistant Director – Education, 25 May 1964. 32. Library and Archives Canada, RG10, 2000-01600-6, Box 053, File 577/36-7-576, Leases & Individual Case Files – Cemetery – Brandon Residential School, Part 01, 1963-06-01 – 1970-03-31, Kirkness to Indian Affairs Branch, Dept. of Citizenship and Immigration, R. F. Davey, 8 June 1964. 33. Library and Archives Canada, RG10, 2000-01600-6, Box 053, File 577/36-7-576, Leases & Individual Case Files – Cemetery – Brandon Residential School, Part 01, 1963-06-01 – 1970-03-31, Regional Supervisor to Assistant to the Director, Education, 17 June 1964. 34. Library and Archives Canada, RG10, 2000-01600-6, Box 053, File 577/36-7-576, Leases & Individual Case Files – Cemetery – Brandon Residential School, Part 01, 1963-06-01 – 1970-03-31, J. D Minnis to D. A. H. Nield, 12 June 1964; Library and Archives Canada, RG10, 2000-01600-6, Box 053, File 577/36-7-576, Leases & Individual Case Files – Cemetery – Brandon Residential School, Part 01, 1963-06-01 – 1970-03-31, D. A. H. Nield to Ford Bond, 12 June 1964; Library and Archives Canada, RG10, 2000-01600-6, Box 053, File 577/36-7-576, Leases & Individual Case Files – Cemetery – Brandon Residential School, Part 01, 1963-06-01 – 1970-03-31, Letter from Ford Bond to D. A. H. Nield, 17 June 1964. 36. This is a reference to Canada’s 1867 centennial. 37. Mayor of Brandon 1962-1969. See: http://www.mhs.mb.ca/docs/people/magnacca_sa.shtml, accessed 13 September 2013. 38. Library and Archives Canada, RG10, 2000-01600-6, Box 053, File 577/36-7-576, Leases & Individual Case Files – Cemetery – Brandon Residential School, Part 01, 1963-06-01 – 1970-03-31, Letter Alfred Kirkness to Minister of Northern Affairs Ottawa, Can. Mr. A. Laing, n.d., [date stamped 15 November 1966]. As James Dempsey notes, IRS students served in Canada’s military: “Dissatisfaction with school life and a need for excitement probably best explain why a number of school-aged natives ran away to enlist. Three native pupils at the Red Deer Industrial School, for example, escaped from the school and joined up, even though they were under eighteen years of age.” Warriors of the King: Prairie Indians in World War I, Regina: Canadian Plains Research Center, 1999, page 46. Students from Brandon who fought in the First World War included Riley Cochrane, Joseph Colin, Alfred Cook who later became Chief of the Bloodvein Reserve, president of the Manitoba Indian Brotherhood, first Aboriginal member of the Manitoba Legislature, second in any Canadian Parliament, and only the 11th member of the CCF to sit in Manitoba. Winnipeg Free Press, 26 May 1959, front page. Oliver Mackin, Alec Moore, Edwin Swanson, and John Kirkness, probably Alfred Kirkness’s brother, also served. Attestation Papers accessed through Library and Archives Canada, http://www.collectionscanada.gc.ca/databases/cef/001042-100.01-e.php accessed 11 August 2013. 39. Library and Archives Canada, RG10, 2000-01600-6, Box 053, File 577/36-7-576, Leases & Individual Case Files – Cemetery – Brandon Residential School, Part 01, 1963-06-01 – 1970-03-31, R. F. Davey, Regional Director – Manitoba to Director – Education Services, 1 December 1966. 40. Library and Archives Canada, RG10, 2000-01600-6, Box 053, File 577/36-7-576, Leases & Individual Case Files – Cemetery – Brandon Residential School, Part 01, 1963-06-01 – 1970-03-31, Regional Director – Manitoba to Director – Education Services, 1 December 1966. 41. Library and Archives Canada, RG10, 2000-01600-6, Box 053, File 577/36-7-576, Leases & Individual Case Files – Cemetery – Brandon Residential School, Part 01, 1963-06-01 – 1970-03-31, S. C. Knapp, Regional Superintendent of Development to Director, Education Services, 25 January 1967. 42. Library and Archives Canada, RG10, 2000-01600-6, Box 053, File 577/36-7-576, Leases & Individual Case Files – Cemetery – Brandon Residential School, Part 01, 1963-06-01 – 1970-03-31, Supervisor of Financial Administration, Development Directorate to Regional Superintendent of Development Manitoba, 17 February 1967. 43. Library and Archives Canada, RG10, 2000-01600-6, Box 053, File 577/36-7-576, Leases & Individual Case Files – Cemetery – Brandon Residential School, Part 01, 1963-06-01 – 1970-03-31, D. A. H. Nield to the Secretary-Treasurer, Brandon City, 24 February 1967. 44. Library and Archives Canada, RG10, 2000-01600-6, Box 053, File 577/36-7-576, Leases & Individual Case Files – Cemetery – Brandon Residential School, Part 01, 1963-06-01 – 1970-03-31, A. J. M. Bell, City Clerk, City of Brandon to D. A. H. Nield, Superintendent, Indian Affairs, 21 March 1967. 45. Library and Archives Canada, RG10, 2000-01600-6, Box 053, File 577/36-7-576, Leases & Individual Case Files – Cemetery – Brandon Residential School, Part 01, 1963-06-01 – 1970-03-31, Regional Engineer – Manitoba to Superintendent Portage la Prairie Agency, 8 May 1967; Library and Archives Canada, RG10, 2000-01600-6, Box 053, File 577/36-7-576, Leases & Individual Case Files – Cemetery – Brandon Residential School, Part 01, 1963-06-01 – 1970-03-31, D. A. H. Nield, Superintendent, Portage Indian Agency, to Acting Director of Indian Affairs, Manitoba, 20 April 1967. On 6 September 1967, Ford Bond wrote to D. A. H. Nield and included a short list of names for the cairn, noting that these were the names were of the people buried in the newer cemetery. His list includes at least 5 non-student/staff names that are crossed off. Library and Archives Canada, RG10, 2000-01600-6, Box 053, File 577/36-7-576, Leases & Individual Case Files – Cemetery – Brandon Residential School, Part 01, 1963-06-01 – 1970-03-31. 46. “Research Station Honors Veteran of 38 Years, Alfred J. Kirkness,” Brandon Sun, 13 July 1967. 47. Library and Archives Canada, RG10, 2000-01600-6, Box 008, File 501/36-4, Miscellaneous Land Matters – School Land – General, Part 04, 1959-02-01 to 1968-11-30, Letter from Alfred Kirkness to A. W. Fraser, Chief - Social Programs Division, Department of Indian Affairs, 20 April 1967. 48. Library and Archives Canada, RG10, 2000-01600-6, Box 053, File 577/36-7-576, Leases & Individual Case Files – Cemetery – Brandon Residential School, Part 01, 1963-06-01 – 1970-03-31, G. G. Kelly, Regional Superintendent of Administration, Manitoba to D. A. H. Nield, Superintendent-in-Charge, Brandon District, 15 August 1968. 49. Library and Archives Canada, RG10, 2000-01600-6, Box 053, File 577/36-7-576, Leases & Individual Case Files – Cemetery – Brandon Residential School, Part 01, 1963-06-01 – 1970-03-31, Buck Matiowsky, Brandon Recreation Commission to D. A. H. Nield, 4 October 1968. In their correspondence it comes out that Matiowsky is referring to Nield’s letter of 24 February 1967, in which Nield informs the Secretary-Treasurer of the City of Brandon that Indian Affairs has “agreed to erect a small cairn on this area and fence” the Curran Park location “at no cost to the City of Brandon.” See Library and Archives Canada, RG10, 2000-01600-6, Box 053, File 577/36-7-576, Leases & Individual Case Files – Cemetery – Brandon Residential School, Part 01, 1963-06-01 – 1970-03-31, D. A. H. Nield, Superintendent, to Secretary Secretary-Treasurer, City of Brandon, 24 February 1967. 50. As discussed in the previous footnote, Nield had explicitly asked for the city’s permission to build a fence and cairn in Curran Park in a letter of 27 February 1967. 51. Library and Archives Canada, RG10, 2000-01600-6, Box 053, File 577/36-7-576, Leases & Individual Case Files – Cemetery – Brandon Residential School, Part 01, 1963-06-01 – 1970-03-31, D. A. H. Nield, Superintendent, to Buck Matiowsky, Brandon Recreation Commission, 24 October 1967. 52. Library and Archives Canada, RG10, 1984-85/402, Volume 13548, File 577/3-8, Part 03, 1968-03-23 to 1972-07-10, Band Management - Complaints and Petitions, Alfred Kirkness to Hon. Jean Chrétien, Minister of Indian Affairs, 22 September 1970. 53. Library and Archives Canada, RG10, 1984-85/402, Volume 13548, File 577/3-8, Part 03, 1968-03-23 to 1972-07-10, Band Management - Complaints and Petitions, W. A. Gryba, Chief, Indian- Eskimo Bureau, Department of Indian Affairs to Mr. A. J. Kirkness, 4 November 1970. 55. Library and Archives Canada, 1984-85/402, Volume 13548, File 577/3-8, Part 03, 1968-03-23 to 1972-07-10, Alfred Kirkness to Honourable Jean Chrétien, Minister of Indian Affairs, 18 August 1971. 56. Library and Archives Canada, 1984-85/402, Volume 13548, File 577/3-8, Part 03, 1968-03-23 to 1972-07-10, G. D. Cromb, Director, Education Branch, to Regional Director, Manitoba, 2 September 1971. 57. Library and Archives Canada, 1984-85/402, Volume 13548, File 577/3-8, Part 03, 1968-03-23 to 1972-07-10, L. R. Radburn, Head, Property and Buildings Management Section to Director, Education Branch, Department of Indian Affairs and Northern Development, Ottawa, 29 October 1971. 58. Manitoba Archives, Girl Guides of Canada, Brandon Meeting Minute Books, March 1962-March 1972, see particularly: 6 October 1969, 6 November 1969, 2 March 1970, 6 April 1970, 1 June 1970, 27 April 1972, 5 June 1972; Library and Archives Canada, RG10, 2000-01600-6, Box 053, File 577/36-7-576, Leases & Individual Case Files – Cemetery – Brandon Residential School, Part 01, 1963-06-01 – 1970-03-31, Girl Guides of Canada (Brandon) to Mr. Bell [Indian Affairs], 2 March 1970. The Guides continued to care for the cemetery until the land was sold by the City to a private owner. 59. Library and Archives Canada, RG10, 2000-01600-6, Box 053, File 577/36-7-576, Leases & Individual Case Files – Cemetery – Brandon Residential School, Part 01, 1963-06-01 – 1970-03-31, J. R. Bell, Superintendent i/c Indian Affairs, Brandon District to Elizabeth M. Wall, Secretary, Brandon Division, Girl Guides of Canada, 6 March 1970. 60. “Girl Guides dedicate plaque at Indian Children’s Cemetery,” Brandon Sun, 7 June 1972, page 19.